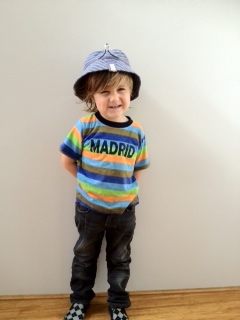 Above is a picture of Julian on the first day of pre-kindy in January and here he is this morning, on his last day. I’m sad. It’s a milestone that indicates that he is growing up so fast. I don’t know if he realises that he won’t go to the centre again or see his teachers and the friends that he’s made. He’s just excited about next year. He’s just excited about his big kindy. He’s just excited about turning four. In an hour I’ll make the last pick-up and as his little mind moves on to what we are doing after school, tonight and tomorrow mine will be reflecting on what has been. Some days I wish I could freeze time so he never grows up. I want him to stay sweet, young and cheeky forever. My little girl is at the same stage so i know exactly what you mean. I feel so sad she is growing so quickly and sad for the end of toddlerhood, but excited about the future! He’s still as beautiful as ever!